I’ve made this cake a few times now. The first time was while Jeremy was in school, and I brought it to a friend’s house to share after dinner. It was absolutely divine, extremely moist with an incredible pure almond flavor. I vowed to make it again when Jeremy came home from school, and I did. The problem was that, lacking a car, we sometimes have to have large grocery orders delivered to us, and although I thought I was ordering almond paste, what I ended up with was almond cake filling. If you’ve ever seen the two, you know there is a huge difference. 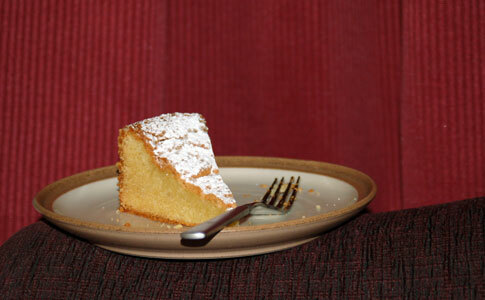 Almond paste is similar to a less-sugary marzipan, almost like a sticky playdough; almond cake filling has coarser bits of almond in a gloppy cornsyrupy base. Anyway, I used it anyway because I was desperate, and needless to say, it was not as good. It wasn’t horrid—we ate it, and it wasn’t a chore—but it certainly wasn’t sublime or soul-saving. I made it again last weekend, to take with us to a friend’s beachhouse in Seaside, Oregon. It had to wait for us two days before we finally had a break between the fudge, caramel corn, ice cream, and taffy to consider other desserts, but was no worse the wear for the wait or the sugary competition. It’s now one of my favorite cakes, when something rich and special—but not super sweet or chocolatey—is called for. Preheat the oven to 350 degrees F. Generously butter sides and bottoms of one 9-inch springform pan. Mix together the sour cream and baking soda in a small bowl. Sift the flour and salt into another bowl. In the bowl of an electric mixer fitted with a paddle, cream the butter and sugar until fluffy. Add the almond paste, a little at a time, at medium speed, and beat for 8 minutes. Beat in the egg yolks one at a time, and mix until incorporated. It may look curdled, but that’s alright. Blend in the almond extract and sour cream mixture. Reduce mixer speed to low and gradually add the flour mixture, just until blended.